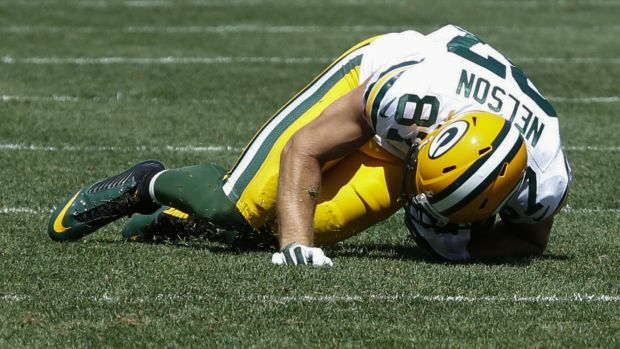 Packers wide receiver Jordy Nelson suffered a season-ending right knee injury against the Pittsburgh Steelers on Sunday. An uncharacteristically cool day in August became a lot colder throughout Wisconsin when the Green Bay Packers officially announced they will be without star wide receiver Jordy Nelson for the entire 2015 season. Nelson suffered a “significant right knee injury” during a non-contact play in the Packers’ preseason game against the Pittsburgh Steelers on Sunday. While it may feel like the season is over after such a devastating loss, in reality, the season is just getting started. Hearts are understandably heavy among Packers fans in Wisconsin, but using Nelson’s injury as a rationale to reduce the number of preseason games would be unwise. Sure, it’s unfortunate that he suffered a season-ending injury during what quarterback Aaron Rodgers called a “meaningless game.” But it was the Packers’ first possession of just their second preseason game. Nelson had every reason to be on the field. Packers Head Coach Mike McCarthy made a point of giving his starters more playing time during the preseason to combat slow starts that have plagued the team early in recent seasons. Injuries can happen at any time. Just ask the Carolina Panthers, who lost their own star wide receiver Kelvin Benjamin for the season after suffering a torn ACL during a joint practice with the Miami Dolphins. The NFL schedule doesn’t slow down for anyone. You can be certain no one in the Packers locker room is feeling sorry for themselves, especially Nelson. Quite frankly, there’s no time to grieve. In less than three weeks, the Packers open the regular season against the Chicago Bears. Nelson won’t be in the lineup, and nothing can be done to change that. Instead, the Packers must focus on the players who will be available to them, and the options are plenty. If there’s any position on the Packers’ roster where they could afford a significant injury, it’s wide receiver. There’s a silver lining in every situation. Because Nelson got hurt now, rather than just before or during the early stages of the regular season, other receivers will be given ample opportunities for reps and can better prepare for what lies ahead. Truth be told, you can never replace a Jordy Nelson – on or off the field. It will be a collective effort. In 2014, he put together one of the best seasons in franchise history, racking up 98 receptions for 1,519 yards and 13 touchdowns. But even in Nelson’s absence, the Packers have a number of offensive weapons. They had their sights set on breaking records this season, and their offense still has the firepower to rank among the NFL’s best in 2015. With Nelson sidelined, opposing teams are more likely to stack the box to defend against the run, meaning Eddie Lacy will have to work even harder to shoulder the load and allow the Packers’ still-talented group of receivers to find holes in the defense. There’s a reason Packers General Manager Ted Thompson resigned Randall Cobb to a team-friendly contract during the offseason. There’s also a reason Thompson drafted Stanford product Ty Montgomery in the third round of this year’s NFL Draft. Those reasons have come to fruition faster than anyone could have expected. The Packers also have a few second-year players who are primed for bigger roles this season, including wide receivers Davante Adams and Jeff Janis, and tight end Richard Rodgers. Adams showed flashes last season and is the most likely candidate to receive Nelson’s share of targets in the passing game. He has received high praise from McCarthy, who referred to him as the MVP of the offseason. Adams and Montgomery have drawn rave reviews during training camp as well. Considered by many to be “Jordy Lite,” Janis possesses the best size (6’3″, 220) and speed (4.42 40) of any receiver on the roster. A seventh-round pick out of Division II Saginaw Valley State a year ago, Janis is raw and needs to work on his route running ability. If he puts it all together, he could fill the deep-threat role as Nelson did, which would open up the passing game. Richard Rodgers has emerged as the Packers’ No. 1 tight end on the depth chart. While he doesn’t scare opposing defenses with his speed, he has great hands and could be a threat down the middle of the field if teams decide to key on Lacy and the versatile receivers on the outside. Let’s not forget about the “Aaron Rodgers factor” either. As the best quarterback in the league, Rodgers undoubtedly makes everyone around him better and has more than enough talent to work with. In limited time, there’s a sense of urgency for the Packers’ young receivers to grow up quickly and establish a rapport with their MVP quarterback. The Packers’ mantra of “Next Man Up” will continue to be their rallying cry. This team is far too talented and too well coached to let Nelson’s injury ruin the season before it even begins. As long as Rodgers is healthy and under center, the Packers’ Super Bowl aspirations in 2015 remain very real.